Learn How We Got Here & Where We Are Going! Top 10 Reasons to Join Us! This is a once a year opportunity to join the larger microcurrent community. Learn exciting new programs and approaches by the country’s foremost practitioners (and even some international)! Experience some pearls of wisdom from the past Decade of this conference! Be inspired by present industry leaders! Gain insight and treatment ideas to integrate into your practice for a healthy future! Rub elbows with some of Microcurrents icons! This venue offers great face to face opportunities with some of the most recognized names in the field. Walk on the beautiful beach. Time to relax and exhale! New! Advanced programs to be announced for Prolo treatments, Shingles, and more! Visit our vendors and check out the newest and best microcurrent and bio-energetic medical devices! Patients/Non-professional attendees are also welcome to learn microcurrent and listen to the miracles presented by advanced microcurrent practitioners. Discount may apply. Be a part of the next decade of this conference and moving Micro forward into a Future of health! Training fee: Please see each training. $595 (early bird $495 by 8/06) including 3-day conference, Exhibitors’ lunch and Award Banquet. *Early bird special has expired. Please check with Vanessa Howe vanessa@HoweRT.com for other possible discount. This year’s conference is the 1st conference in the second decade. All attendees will receive a special “Decade II: The Past, Present & Future – Microcurrent” gift. One day pass (Friday or Saturday) is available for half price. Patients/Non-professional who are seeing a pracitioner may receive $100 discount on 3-day conference. Please use “Register – Patients” button to register. We have a phenomenal line up of speakers! “MICROCURRENT DIAGNOSIS”. Everyone speaks on therapeutics, but no attention to assessment using microcurrent. That would be of prime importance for electrode placement, etc. Dr. Charles McWilliams is founder of the Pan-American College of Natural Medicine and he is a member of Grand Master of the Sacred Medical Order of the Knights of Hope. He is one of the true living masters on Frequency Specific Microcurrent having published one of the earliest books on frequencies in 1994. This was based directly on the work of Dr. Albert Abrams and Dr. Harry Van Gelder. He received the “Life Time Achievement Award in Microcurrent” in the 10th Annual Microcurrent Conference in 2016. Dr. Kondrot is the world’s leading homeopathic ophthalmologist who devotes his practice to traditional and alternative therapies for the treatment of eye disease. He was the president of Arizona Homeopathic and Integrative Medical Association(AHIMA), and he is the clinic director of the American Homeopathic Medical College. His two best-selling books, Healing the Eye the Natural Way and Microcurrent Stimulation: Miracle Eye Cure, share this knowledge. Both books are solid introductions to his philosophy and practice. Another book, Ten Essential to Save Your Sight, has received rave reviews. He has enhanced his position as a spokesperson for alternative medicine through the publication of Top 20 Doctors in America, proceedings of recent microcurrent conferences, and the groundbreaking Chelation Therapy. He is the host of the weekly radio show, Healthy Vision Talk Radio, broadcast on KFNX Talk Radio. Dr. Kondrot received the “Life Time Achievement Award in Microcurrent” in the 9th Annual Microcurrent Conference in 2015. Dr. Peña is Ophthalmologist trained in Colombia and in the USA (University of Southern California and Doheny Eye Institute), with special emphasis in anterior segment surgery, ophthalmic clinical and epidemiological research, primary eye care and prevention of blindness. He is also the Advisor and Consultant for Lions Clubs International Foundation-Sight First, American Academy of Ophthalmology, American Health Organization and Vision 2020 Latin America. He is also Professor of Ophthalmology in various residency programs in Latin America, the “Fundacion Vision” in Paraguay, the “Fundacion Oftalmológica del Caribe” in Colombia, and the Colombian Society of Ophthalmology, Advisor/speaker for pharmaceutical laboratories. He has developed projects related to retinopathy of prematurity in Paraguay and Colombia. Organized Courses and Workshops for prevention of blindness, community eye health, research, leadership and management, and was involved in the evaluation of eye care services in Haiti after the earthquake in 2010 and presentation of the results to several NGOs of the region in Santo Domingo. Dr. Cowden is a certified cardiologist and internist, and a member of the scientific advisory board of the academy of Comprehensive Integrative Medicine (ACIM). Dr. Cowden has worked extensively with diseases and detoxification in connection with emotional conflict and unresolved emotional issues that play a large part in hindering the healing process. He will be presenting interesting material and protocols involving energetic (electrodermal) testing along with the integration of microcurrent application for treating, healing, and detoxifying the whole body. Sara McVey is a board certified Licensed Acupuncturist that specializes in treating patients with complex pain with multiple pain generators. In 2010 she became the first Ohio Acupuncturist to integrate frequency specific microcurrent and acupuncture. She now is proficient in multiple microcurrent therapies and techniques to address a wide range of pain and health issues. She teaches the use of acupuncture and microcurrent techniques at the American Institute of Alternative Medicine. She will be presenting on the use of acupuncture and microcurrent for chronic post-surgical back pain. Vanessa Howe, MSPT is a physical therapist and pioneer in the area of Resonance Based Technologies. She integrated microcurrent (Frequency Specific Microcurrent-FSM) into her Physical Therapy practice in 2005. Since then, she has been a national instructor who is viewed as an innovative programmer of both current (electrical stim) and magnetic fields (pEMF). She has taught physicians, therapists, and trainers from all over the world. She is regarded as one of the foremost authorities in use of microcurrent for athletic injuries, both working directly with and consulting with some of the top athletic cases in the country. Vanessa works with athletes from the NFL, NBA, MLB, Olympic Sports of gymnastics, soccer, NHL, and many NCAA sports. Meanwhile her clinic continues to serve a general pain population in the northern suburbs of Detroit, Michigan. Vanessa is an active speaker in the area of Microcurrent, as well as Resonance and BioEnergy Medicine. She has been a highlighted Keynote Speaker for this conference for the past 4 years. She joins us this year as a co-chair. Dr. Nebbeling is an osteopathic physician who has practiced integrative medicine for 30 years. His primary focus has been working with a variety of musculoskeletal issues involving sports injuries, personal injuries, and general musculoskeletal problems presenting with acute and chronic pain. He has also been able to address difficult cases involving the endocrine system and digestive system, some of these cases presented with unresolved chronic issues encompassing gastrointestinal and thyroid complications. Dr. Nebbeling has incorporated the use of frequency specific microcurrent methods in many of his treatments, including GI and thyroid, and has seen positive results. Dr. Nebbeling will be sharing techniques and results in the use of the frequency specific microcurrent machine with his patients. Training #1 Microcurrent Get Started and Level One training, Sept. 20~21. “Getting Started” is mainly for patients who want to quickly gain an understanding about microcurrent and how it can be used to improve health and vision. The goal of this program is to help patients select the right customized microcurrent protocols. You will learn the History of Microcurrent, Why Microcurrent is the Medicine of the Future, Authoritative Resources on Using Microcurrent, How Microcurrent Can Help With Vision Problems (And Which Ones It’s Results Are Extraordinary), Introduction on How to Use a Microcurrent Machine, Discerning Which Microcurrent Machine is Best For You, Experience the Healing Effects At the Workshop Through Hands On Use, Develop Your Own Protocols for Treatment. “Level One” Training is for the practitioner or patient who is interested in learning more about microcurrent and the vast application of the Inspirstar Microcurrent machine. You will learn the basics of microcurrent and frequencies, how to add and change programs, program your own treatments. This training needs moderate knowledge of PC operations, needs to bring your own window PC computer to the workshop. Software and cable ($595.00) is not included in the tuition. Training #2 Microcurrent Level Two training, Sept. 21 Only. Level Two training is for practitioners and patients who have owned Inspirstar device and software and want to learn more advanced features. You will learn the following: advanced waveforms explanations and the use of difference waveforms; Real Time to enable visualization of frequencies delivered to the body in real time on your computer monitor; Random Frequency/Loop to specify and control random frequency which is reported to work better than specific frequency in some studies; IS02 advanced features especially IS02PRO, the most advanced “Game Changer of FSM device”; and the discussion of current flow in the body. This was 2-day class and I try to squeeze it to 1-day to save your travel time. Training Bonus: Profile Editor Real Time feature and Random Frequency/Loop feature For Free( $150 value). Training #3 FSM321: Reboot Your Practice with Advanced Programming, Sept. 21 Only. You asked for it! In this 1 day course, acclaimed programmer and practitioner Vanessa Howe will share her methodology and philosophy of programming. Developed for the active practitioner, this class will focus on how to take your “good” outcomes to “great”. Learn how to decide which frequencies to run longer, shorter, and loop processes. Practitioners are encouraged to bring real life, challenging cases to problem solve and discuss. A limited number of cases will be selected from submitted cases (deadline Sept 5th) to be incorporated into the class outline. Sign Up and submit cases early! Cost of Program: $295. Contact Vanessa at: vanessa@HoweRT.com for more information and available Presenter Discount Pricing on this course. 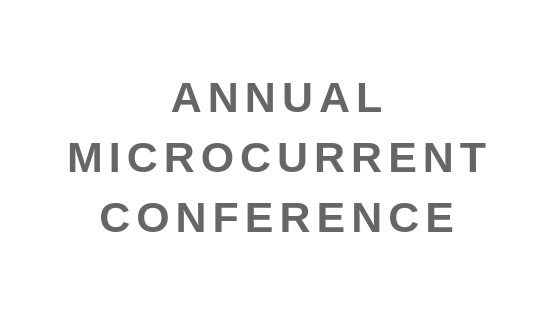 Each year more than 10 microcurrent cases are presented by microcurrent practitioners in this annual conference. We appreciate if you have an interesting case to present whatever big or small case to share with the community. Please send the case name and brief to co-chair Vanessa Howe vanessa@howert.com . Because only limited cases can be presented, please submit your case ASAP. Top cases will win Case Presentation Award. We would like to invite you to participate in the Conference and showcase your products/services to our physician and nonphysician participants. Standard exhibitor fee is $850.00 which includes a 9 X 9 space with table and chairs. The Exhibitor area is next to the speakers room and we will have all breaks in the exhibitor area. We have limited number of electrical outlets and they are $10.00/ day. WiFi may be purchased with the hotel. If you are interested in more space, each additional 9 X 9 area will be an additional $850.00. Each exhibitor space includes 1 badge for the 3-day conference, exhibitors lunch and award dinner. Additional badge will pay regular attendee fee $595.00(early bird $495 by 7/31). Each exhibitor will give a short introduction (~5 minutes) of your products or service on 9/22 Friday’s Exhibitors Lunch. We also have an opportunity for exhibitors to sponsor a Lunch on Saturday and Sunday. Each sponsorship event will include the opportunity for a 30 minute presentation. This is a great marketing opportunity. It will go very quickly. Please contact me ASAP if you are interested in these sponsorship. Space is limited. Please let us know if you are willing to join us to share your excellent products. Please register below, or contact co-chairs/staff if you have any question. Conference Group Rates: Standard $119.00; Pool $129.00; Gulf Front $159.00, 13% tax ~ no resort fees. These Group Rates will expire on August 20. Please call reservation toll 1-800-237-8916 to reserve the room. Please mention Group code G/MICR/2017 or Microcurrent Conference. Hotel online booking not available for our group booking. All rooms have two double or queen beds, mini refrigerator, Microwave & Coffee maker. Some poolside and all Gulf front rooms have private balconies. All group rates are for up to 4 persons in a room. Roll-away charge is $15.00 per night. Three days pre and post rates will be honored if available.Free parking (one car per room). Room cancellations are accepted up to 72 hours prior to arrival. One night’s room charge penalty will be accessed for those not cancelled and/or no show. Note: Please call hotel reservation toll number and use our conference group name to make reservations, instead of using other website or local travel agency because the hotel has a requirement of guest rooms booked by the conference. Thank you for your support! If you want us to book hotel for you, please let us know.